Love the tiles - Where did the tiles on the front of the island come from? Can anyone help please? Where did the black bar stool come from? Range hood - Hi, does anyone know where to source this range hood or similar ? Thanks!! 3. Your finishesLet your visual reference and colour palette direct your selection of finishes for cabinetry, benchtops, taps and sinks. In a Norwegian wood theme, add contrast by combining blonde veneers with white stone or black granite benchtops and add interest with geometric pattern tiles. If installed in an island bench, taps and sinks become the focus of the entertaining area, so for minimalist looks, choose something sleek and sculptural. The other way to future-proof a trend is to embrace it with gusto. Confidence is key when it comes to interiors that work, and the face of this kitchen island is a case in point. Tiling the front of your island with graphic or whimsical tiles says a whole lot more about your personal style than one that simply matches the kitchen cabinetry. Alternatively, you could liven up a kitchen island with some flamboyant tiles and finish the striking feature with a shapely stool or two. Still in Melbourne, this kitchen has an impressive stone island bench that reflects the restrained palette throughout the house. Adding pattern, the encaustic tiles are Honeycomb Hex by Popham Design, a Moroccan studio where all tiles are handmade by skilled artisans. 1. 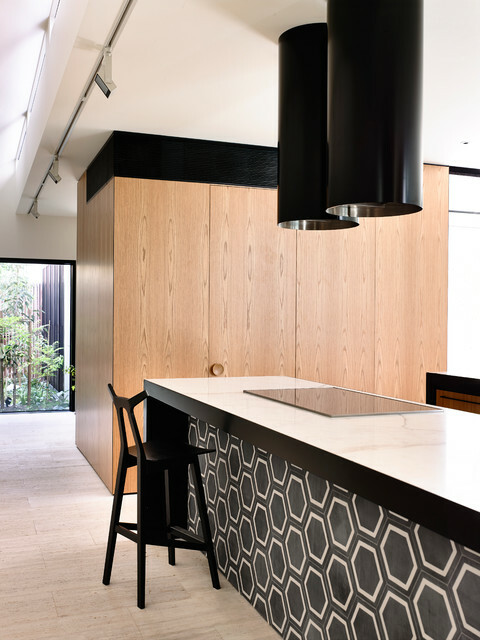 Kitchen joinery – restrained approachLining the outer face of this kitchen island in geometric-patterned tiles brings the room to life and makes it feel less utilitarian – perfect for a kitchen that extends into an open-plan living and dining space where decorative appeal is key. Tip: The tiles on the face of this kitchen island have been cleverly contained within a border created by the benchtop and the slab end. Using this technique means that if you tire of the tiles, you can simply replace them without affecting the rest of the island unit. 27. Location: St Kilda West, VictoriaDesigner: Kennedy NolanFeatures: The island face is prime real estate when it comes to a place to put pattern.